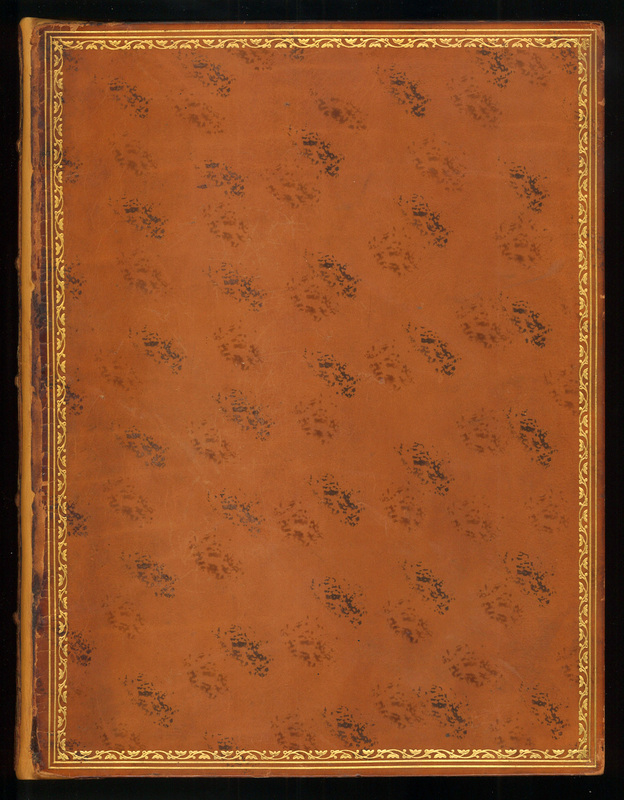 Did a Cat Help Decorate this Binding? 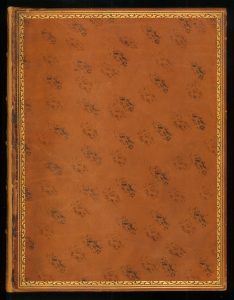 The style of book binding above with mottled leather is called Cat’s Paw, appearing to have had little inked feline foot pads walk over its covers. 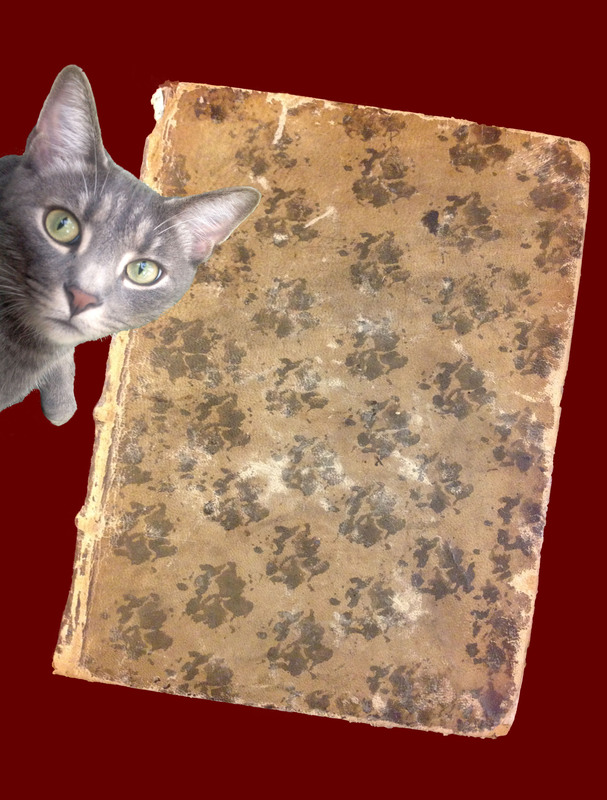 But no, this design is actually made with various types of stains and colors, applied in the binder’s workshop without the aid of a willing cat accomplice. 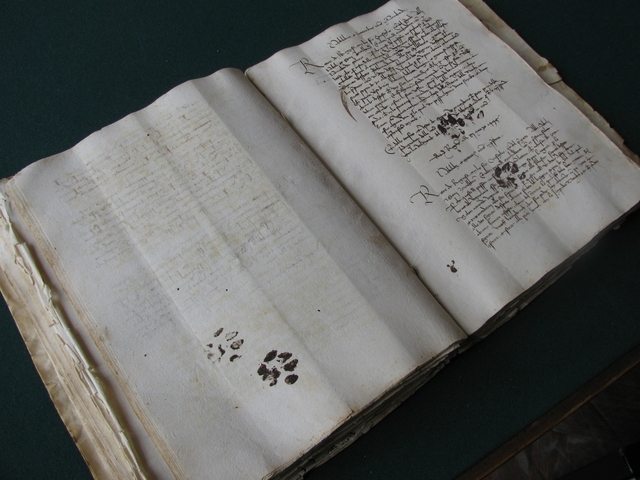 The Internet was leaping a couple of years ago with accounts of evidence of a no-doubt confident and curious kitty jumping into fresh ink and then onto open leaves of a 15th-century Croatian manuscript, so it is a nice (if inaccurate) thought, one encouraged by the axiom familiar to cat owners everywhere: for a cat, paper, especially paper actively being read by one’s human, simply must be walked across or sat upon. In the modern era cats have moved on to keyboards. 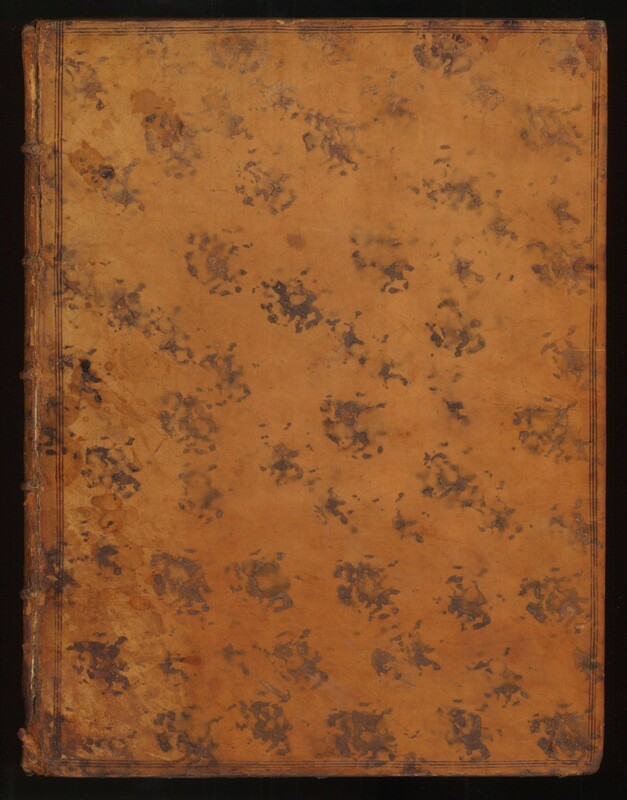 According to the site, the Language of Bindings online thesaurus (essential for those of us who describe book bindings), it is usually not possible to identify the actual types of stains applied. 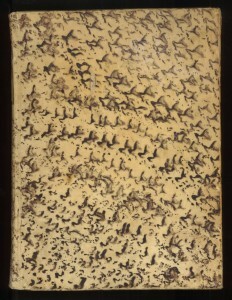 For mottled decoration, no adequate, complete terminology exists. 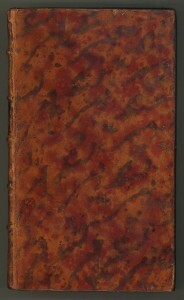 Acids or colors were most often dabbed on calfskin, a desirable binding material for its tight grain and sheen, although other leathers were also used. 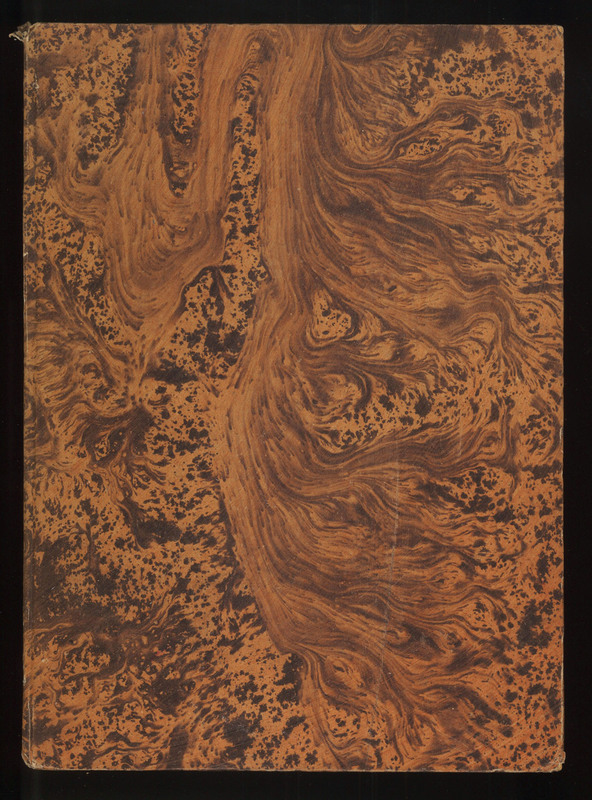 Stains could be used to create patterns described as tortoiseshell, marbled, or sprinkled (speckled) as well. 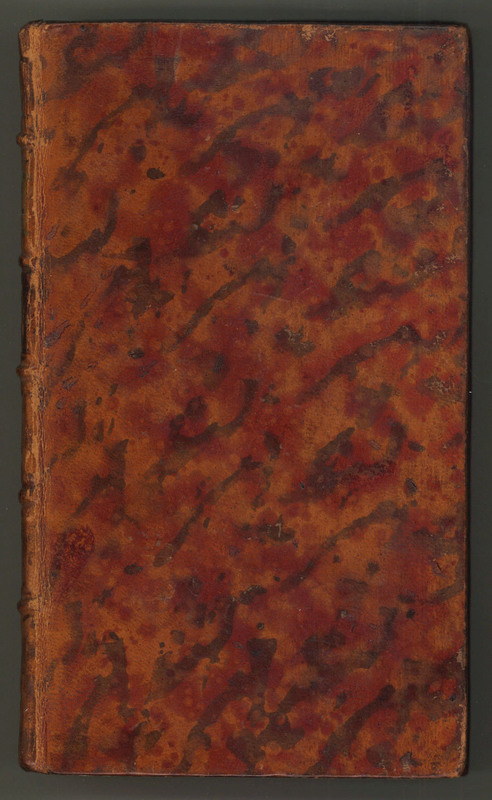 Red and green acid stains are often called Spanish binding. 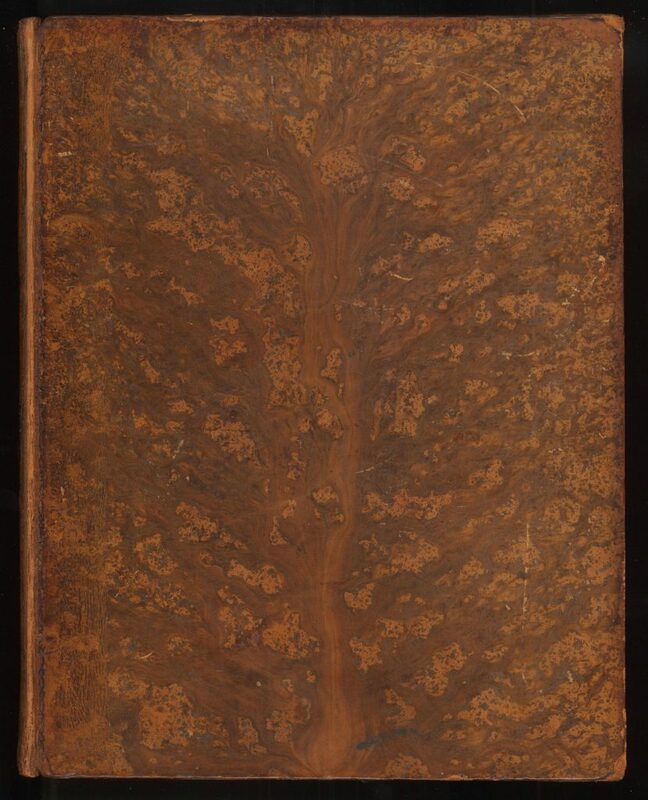 One related type of decorative mottled leather that is easy to spot is called Tree Calf (although it also appears on other leathers, such as sheep). 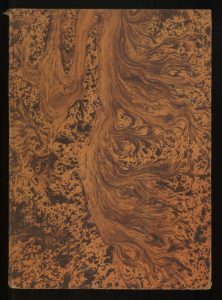 This pattern resembles a trunk with branches or wood-grain. On the shelves in the Smithsonian Libraries collections are both elegant volumes and practical treatises and manuals with tree calf bindings. 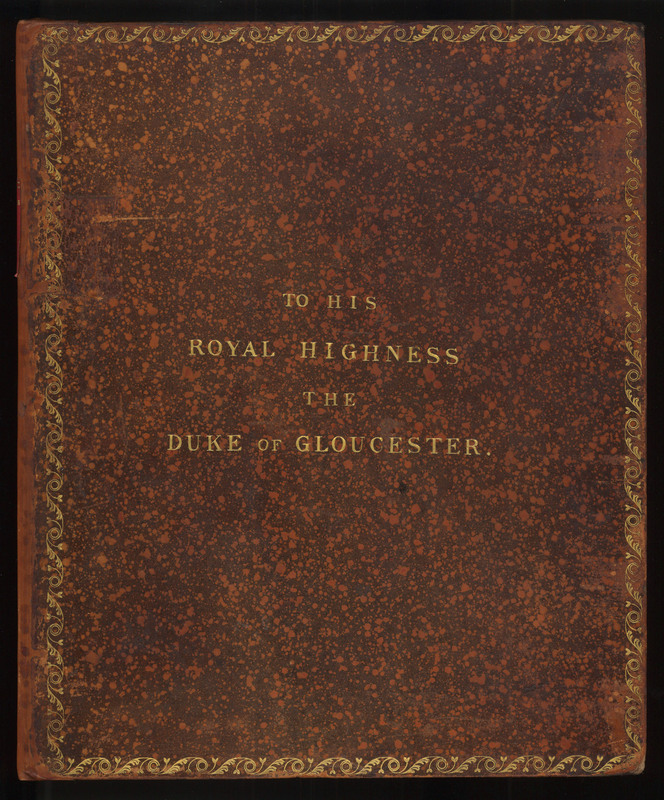 Sometimes additional gilt decoration and marks of ownership were applied to the covers, gilding the mottled leather. Cat’s Paw is readily identifiable, if sometimes only vaguely resembling paw prints. 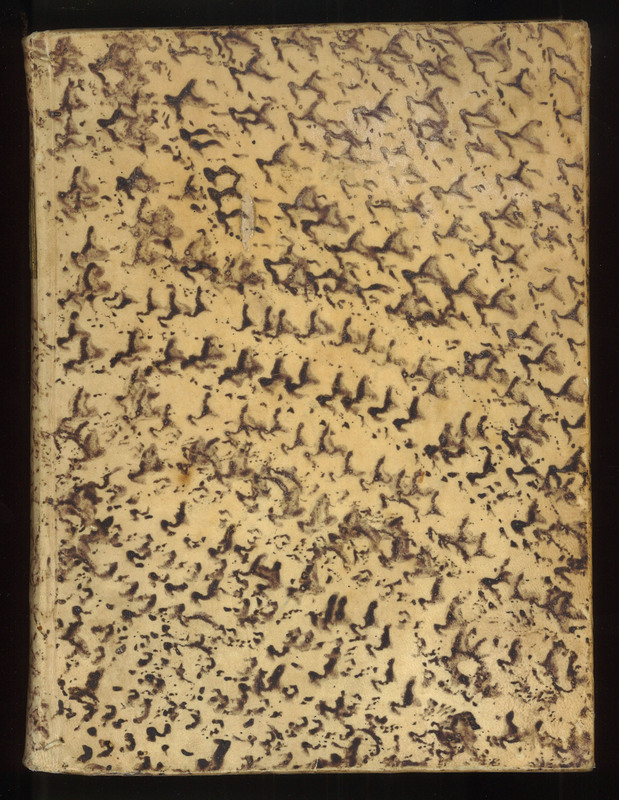 The pattern can be irregular, appearing to have been applied with a heavy hand – er, paw? – with the acid biting deeply into the leather, other times quite beautiful with a regular, light touch of the motif. This design was popular from the later part of the 18th century. 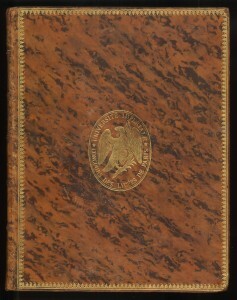 The rare book collections of the Smithsonian Libraries have many examples, lurking, waiting to be carefully handled and admired (see additional examples below). But, take notice, kitties, not walked across, or sat upon! 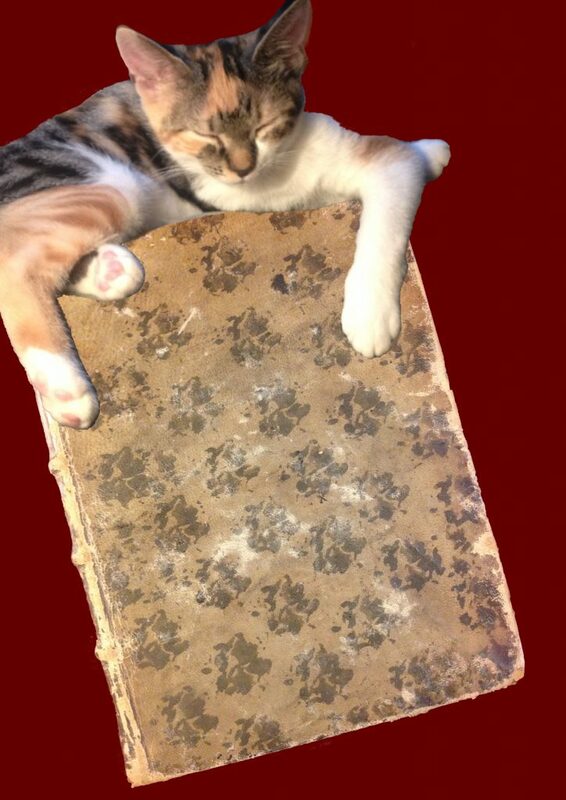 Gif by Richard Naples featuring the author’s cat. No rare volumes harmed! Kirsten van der Veen, Richard Naples, Diane Shaw, Nessie, and Hobie Cat did everything for this post. I’ve been a Book-repairer and book-binder for nearly 60 years, but only once or twice have ever touched a Leather Bound book. However, lovely as all the fine decorative leather books you have displayed on your website, They don’t last! These fine books have been preserved in Libraries, not “heavily Read” I have seen hundreds and hundreds of old leather bound books that have lost their spine. 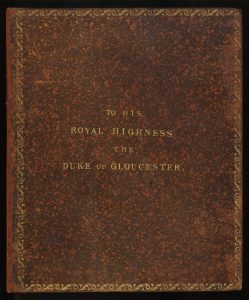 Cloth binding really seems to has proved itself about as long-lasting as leather bound books.The Mary Rose gives us wooden-covers used to fit around their books ( all leather bound), to help preserve the book. 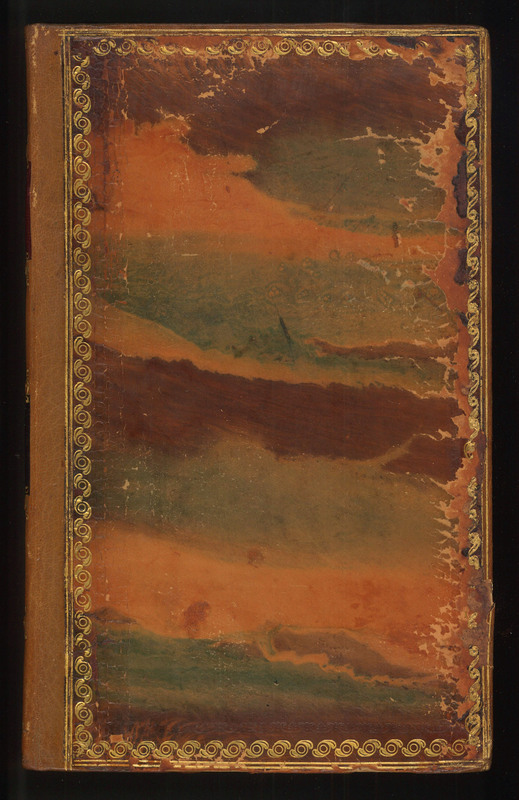 Cloth binding is rarely as pretty as a well-made decorative leather binding,but have you seen those lovely pictorially-gold-stamped cloth covers on, for example, books on Conjuring of the 1800s, sold to be used as birthday presents for boys.